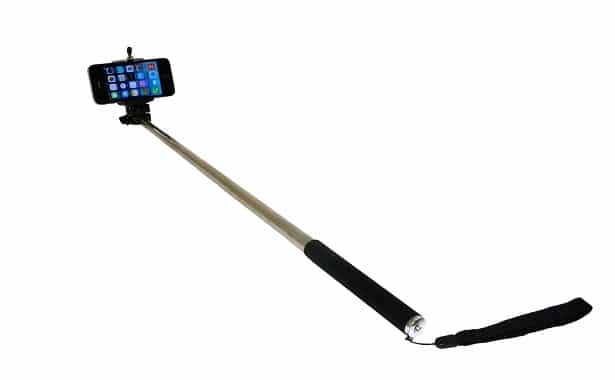 One of the most popular items of today is the selfie stick. Selfie stick is the gadget you need to have with you. It’s simple, a stick with bluetooth on which you put your smartphone, used for spectacular selfies. Once, the selfie stick was known as a monopod. Basically, it was a one-legged tripod used for cameras. With the advent of smartphones, these objects have been modified. They are a support for different smartphone sizes, telescopic, to be carried easier and they help you take a better selfie. Basically, you have a longer arm. The price rance for a selfie stick is about $15 -$99. How many types of selfie sticks are there? You can buy two versions. The most advantageous is the one that has bluetooth. You have to charge the battery of your selfie stick occasionally by using a micro USB cable. To make it work, you connect it to the phone and using a button you can take a photo with the front camera. Although they cost a little more, these are the most effective. There are selfie sticks that connect to the headphone jack of your phone. These have the advantage that they do not have to be connected via Bluetooth with your phone, which can be problematic for some devices and it also consumes your phone’s battery. There is another version with no Bluetooth, which can be connected in two ways. We basically have a passive selfie stick, that does not connect to the phone, it just keeps it in the support. To take photos we can use a tiny remote control with bluetooth or the camera’s timer. Be careful what you buy. The grip is very important. Basically you lift on the top of the stick a few hundred dollars. It would be better not to fall from there and the stick to be practical, so it wouldn’t give you any trouble. Do not forget to check if your phone or pad fits in the provided support, before you buy your selfie stick. When did the selfie sticks appeared ? No one knows exactly which was the first selfie stick on the market. On November 20, 2014, the selfie stick was included in “Time” magazine among the best inventions of the year, after the year 2013 was named The Selfie Year. The selfie stick has its origins in Asia, Indonesia, Malaysia, Philippines, South Korea and Japan. Meanwhile, they arrived also in The US and Europe and in major tourist cities you can already see people who use them. According to the “Quartz” magazine, there are 130,000 photos on Instagram with the hashtag #selfiestick. 10. Jökul Sweden Monopod – the price is about : $14.99. Should the average working Joe get a selfie stick ? If you’re a big fan of selfies, then the selfie stick is what you need. There are a few cheaper items that won’t affect your monthly budget all that much, so getting one shouldn`t really be that much of a problem. It is also a great present to offer to people that really like to take pictures. How Much Do Niche Perfumes Cost ? How Much Does Drug/Alcohol Testing Cost ?